Almost 100 hours ago Oracle SOA Suite 12c was released and 72 hours ago BPM Suite 12c had it turn. At AMIS we held a 50+ hours blog-a-thon and published a total of 25 blogs. This blogs looks back at the release of SOA Suite and BPM Suite 12c. On Thursday 26th of June at 09:00 AM PST (06:00 PM CET) Oracle release SOA Suite 12c. Right after the release we published the first blog with the most striking features. Together with us a lot of people followed what happened next on twitter, the 12c madness exploded. Right after the released the first people downloaded the software and posted the first pictures and experiences with the installation of the SOA Suite quick start. The whole night I followed the tweets from the SOA community and the product managers of Oracle that made it all happen. First look at SCA Composite features This blog will summaries the features specific to SCA Composites / BPEL and the Enterprise Manager Dashboards. The features are summarised, but most will get an own blog that tells about the full details. The following features are discussed; Changed project / directory structure, Project / Component en Scope Templates, updates to the composite editor, updates to the mediator, updates to the BPEL component / activities, the Fault Policy Editor,SOA Composer refresh in 12c and the SOA Suite Debugger. Read more. All about Developer Productivity and Performance This blog will summaries the features specific to the Developer Productivity and Integration in JDeveloper and in the Enterprise Manager. The features are summarised, but most will get an own blog that tells about the full details. The following features are discussed; Developer installer, Integration of SOA and SB development, New technology adapters, New Database Connection Types and Performance & Optimization. Read more. First look at Service Bus features This blog will summaries the features specific to Service Bus and the Enterprise Manager Dashboards. The features are summarised, but most will get an own blog that tells about the full details. Oracle renamed the product from OSB (Oracle Service Bus) to SB (Service Bus), apparently it also stands for Oracle Secure Backup. The following features are discussed; Integrated with JDeveloper, Splitting Proxy from Pipeline, Kick-start an Service Bus (SB) project using templates, MDS support for importing shared resources and possibility to enable/disable activities. Read more. The Star of the SOA Suite 12c – The Pipeline Every new product release has a star. And of course picking that star is arbitrary. One person’s favorite feature may not be someone else’s. My pick of the 12c crop is … (drum roll) …. the Pipeline! The Pipeline is new – to some extent. In Service Bus 12c, instead of a Proxy Service that contains a Message Flow as we used to have in previous incarnations of OSB and Aqualogic Service Bus, we now have two separate components: the Proxy Service and the Pipeline (which contains the Message Flow). Read more. Introducing the REST Adapter. Calling a RESTful service returning JSON The REST Adapter is an important new feature of Oracle SOA Suite 12c. This new adapter allows easy calling/exposing of RESTful services (see https://technology.amis.nl/2014/05/14/what-is-rest/ for an introduction to REST) based on a WADL or configured manually. Not only does Oracle introduce the REST Adapter, but JSON support is also added in SOA Suite 12c. These features will greatly increase the integration options and flexibility of Oracle SOA Suite. In this blog I’ll describe how a RESTful service can be called by using the REST adapter. Read more. BPEL Inline Sub Processes or locally Reusable Chunks of BPEL process logic An in-line sub process can best be thought of as a callable scope. It is a scope that is not part of the normal process flow, but rather a unit of encapsulated logic that can be called zero, one or multiple times from anywhere within the BPEL process – even recursively from within itself. It is in effect very similar to a private member function in a Java Class or a procedure in the body of a PL/SQL package. Read more. Sharing resources between development environments: Export from and Import to Design Time SOA MDS repository The MDS repository is an important mechanism for SOA Suite 12c, both at design time during development as well as at run time. At design time, MDS is used to host shared resources such as WSDL and XSD documents that are referenced in many different places. Instead of copying these resources between applications and projects, MDS is concept that is native to JDeveloper and therefore much easier to use with these shared resources. Read more. Dynamically overriding attributes of static routing rules in Mediator component Routing Rules in a Mediator component carry several attributes that govern the routing rule run time behavior. These include: XSLT or XQuery used for transformation, the filter expression, target operation, the parallel or sequential indicator, the Schematron document used for validation, the native validation and the value assignment (for example for header properties). Read more. Where to find Service Bus Pipeline Alerts In SOA Suite 12c, the Service Bus console no longer exists. The Service Bus specific run time browser interface is not intended for administration activities: all administration around SOA Suite 12c is consolidated into Enterprise Manager Fusion Middleware Control. So a valid question now becomes: how to locate pipeline alerts produced in 12c Service Bus run time environments? These are of course to be found in EM FMW Control. But where and how exactly? Read more. Native Format Translation in Service Bus Pipeline – XML to and from JSON, CSV and fixed position formats Data offered as internet resource in a structured XML or non-XML format (such as JSON, CSV or fixed position) – cannot be retrieved by the File Adapter, but it can be read by the Service Bus. Using a combination of an HTTP transport style Business Service, a Service Callout and a Native XSD mapping, it turns out to be fairly easy to implement what is best described as a remote file adapter. Read more. Using Domain Value Map (DVM) in Service Bus projects Domain Value Maps are still DVMs in SOA Suite 12c. Create them in JDeveloper, use them in Transformations and Assignments in Mediator and BPEL. Inspect them and edit them at run time using SOA Composer. Nothing really new there. Read more. BPM Suite 12c: Oracle Business Rules – Verbal Rules In this blog post I will transform a Decision Table step-by-step into the new Verbal Rules. As a starting point I created a composite with a BPM, a BPEL and a Rules component. Both BPM and BPEL components use the same Rules component. See the following three screenshots. You can download the sample application with this starting point from here. Read more. Neat little feature in Service Bus Pipelines: Disable/Enable Activity to ease development Sometimes it is just a small feature that can make life easier. 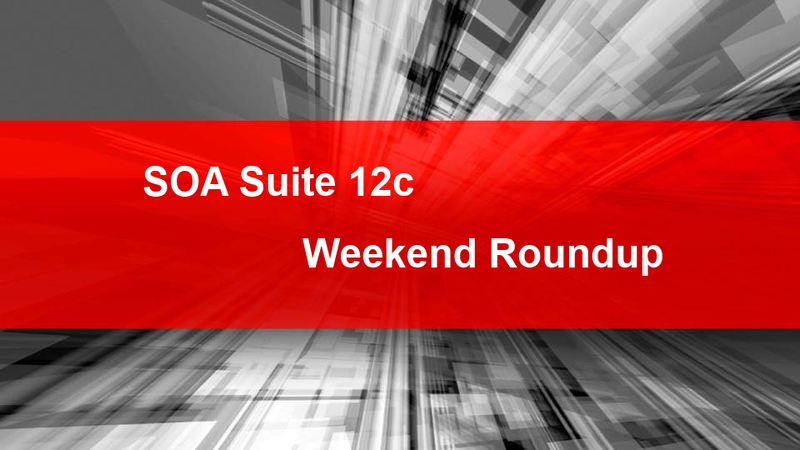 SOA Suite 12c is full of large, sweeping new components and grant improvements. And it also has a ton of smaller things. One such smaller new thing is the ability in Pipelines in Service Bus projects to disable an activity. Sounds perhaps like something you would typically not want to do – add an activity then disable it. Read more. Support for reusable XQuery Libraries | Modules It featured in many forum discussions (such as this one) in the last few years: “The Oracle Service Bus XQuery engine fully supports all of the language features that are described in the World Wide Web (W3C) specification for XQuery with one exception: modules”. See for example the W3C spec. Library Modules would make it possible to create reusable XQuery functions, that are available for use in any XQuery transformation. Read more. First steps with the Coherence Adapter to create cross instance state memory One of the new adapters shipped with SOA Suite 12c is the Coherence Adapter. This JCA adapter makes it easy for a Service Bus business service or a SOA composite application to interact with a Coherence memory grid. Fully declaratively and with very little trouble, data can be put on a Coherence grid (aka cache) and read from that cache. The cache is accessed like a big map: using a key, an object is saved to and retrieved from the cache. The cache is accessible across service executions and process instances, as well as across cluster nodes. Read more. Property window for inspecting and editing BPEL activities Before release 12c, editing activities in a BPEL process was done in the wizard that could be activated by double clicking the activity or by selecting edit from the context menu on an activity. Alternatively, a developer could resort to the BPEL process source file to make changes to the definition of activities. In 12c, the property inspector has been extended to also support editing the properties of BPEL activities. When the property inspector window is available, it will synchronize with the currently selected activity in the BPEL editor. Read more. BPM Suite 12c: Quick Start installation – 20 minutes and good to go Oracle released BPM Suite 12c. Just like SOA Suite 12c – released the day before – this release comes with the quick start option: to quickly start going through development and test iterations, the development environment (JDeveloper + BPM Studio) is now equipped with an Integrated WLS that contains the BPM Suite 12c run time engine. All one needs to not only develop but also to run a BPM process is packaged in a single environment that is installed from a single file. Read more. For full list check our SOA Suite 12c overview. SOA Suite 12c is available for download SOA Suite 12c is a major step forward to become an “Industrial SOA” and developer productive solution. Key new features include: Performance & Optimization (Modularity, Composite Lazy Loading, WLS Work Manager Based Tuning) and Diagnosability & Manageability (Task Based Enterprise Manager, Enterprise Scheduler Service). Read More. Using the clone ability to duplicate a Service Bus 12c project (by Jan van Zoggel) It’s quite common in a service oriented landscape that a newer version of a service is required. For instance due to new functionality for 1 service consumer which brakes the contract for the other consumers. JDeveloper 12c has a cool feature helping us to clone a Service Bus project. Read More. Getting started with Oracle Service Bus 12c: importing 11g sources (by Laurens van der Starre) One of the new features is that Oracle Service Bus development is integrated into Oracle jDeveloper Studio. One way to get started quickly is by simply importing your 11g service bus sources into 12c. First export your 11g sources, either from the Servicebus Console or Eclipse (OEPE)… Then, this sbconfig.jar is easily imported into the new Oracle jDeveloper Studio 12c (as expected). Read more. At last my tl cools a bit down after the @soacommunity blogathon. An amazing nr of blogs published in 50 hrs. Nice job @AMIS_Services ! @robertvanmolken @AMIS_Services not giving a chance for others… 🙂 gr8 articles..still gng thru them..